William Shatner is presented with NASA’s Distinguished Public Service medal by Bob Jacobs, NASA Deputy Associate Administrator, Communications, on April 26, 2014. NASA saluted Captain Kirk over the weekend, giving William Shatner the Distinguished Public Service medal, the space agency's highest award for civilians. The 83-year-old Canadian actor played Captain James Tiberius Kirk, one of TV's most beloved space pioneers, who commanded the starship USS Enterprise in NBC's "Star Trek" from 1966 to 1969. In real life, Shatner has been a vocal advocate of science education and space exploration. "He's most deserving of this prestigious award," Weaver added. 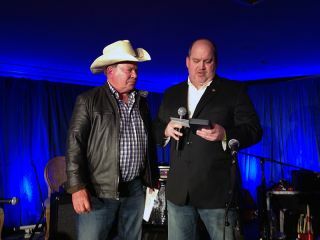 Shatner accepted the honor Saturday evening (April 26) in Los Angeles at his Hollywood Charity Horse Show, an annual event in which he raises money for children's causes, NASA officials said. According to the medal's citation, Shatner was honored for "outstanding generosity and dedication to inspiring new generations of explorers around the world, and for unwavering support for NASA and its missions of discovery." NASA and the Star Trek franchise forged a mutual admiration society a long time ago. References to NASA and its programs were written into Star Trek storylines throughout the TV series and films. Originally called Constitution, NASA's space shuttle prototype was named Enterprise in honor of Star Trek. Shatner has been more than happy to be an informal spokesman for NASA, especially in recent years. In 2011, Shatner beamed a wakeup call that recreated his "Star Trek" introduction to NASA astronauts working on the shuttle mission, STS-133, the final flight of the shuttle Discovery. The next year, he recorded a message for the real-life spacemen living aboard the International Space Station. And to help drum up excitement for NASA's Curiosity Mars rover, Shatner narrated a video about the robot that was released just a week before it landed on the Red Planet in 2012. Shatner has also supported his home country's smaller space agency; last year, he traded tweets with astronaut Chris Hadfield, Canada's first space station commander.